A precious dolphin travels up to a stately town beside a giant waterfall. In the morning, the group arrived in Portland, Oregon and boarded a vessel called Crystal Dolphin. This was a chartered voyage exclusive to our Wells Gray Tours group. The group cruised up the Willamette River about 15 miles to Oregon City (the “Stately City”) and Willamette Falls. Winners of this clue were Barb Donaldson and Edie Hodgson. After that the tour drove south an hour to Silverton to stay 3 nights at Oregon Garden Resort. In the evening, the they enjoyed a reception featuring local Oregon wines and cheeses, followed by dinner. 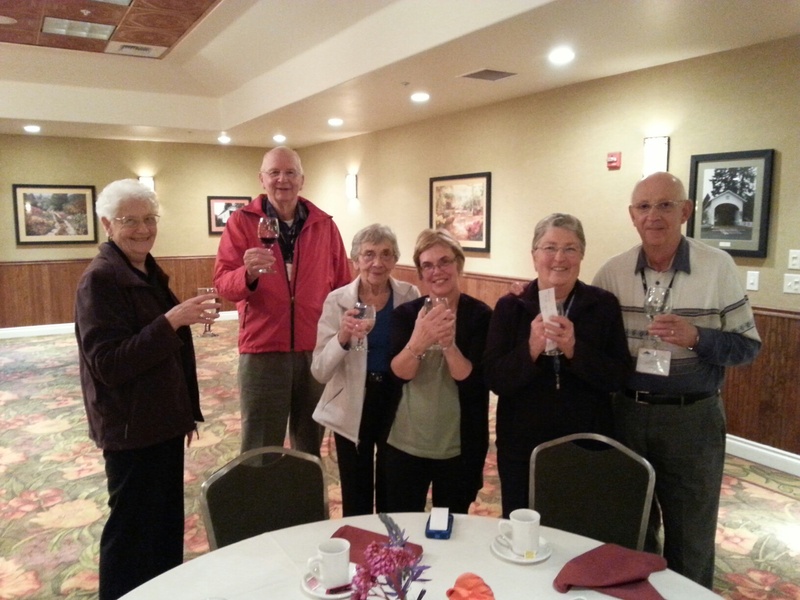 (L-R) Edie & Slim Hodgson, Doris Sharp, Jan Smith, Mary & Dave Rolston at the reception.